Weekly Glimpse #1: Edit Mode Spotlight – Polska Lemon Ltd. 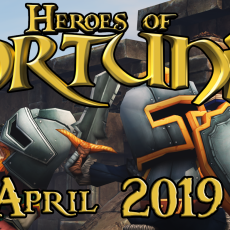 This post is going to be the first in a series of weekly updates regarding the development status of Heroes of Fortunia. From now on, you can expect one such post to appear on this blog every Friday at 7pm European time (6pm UK time), leading up to the planned closed beta test starting near the end of 2018/the beginning of 2019. 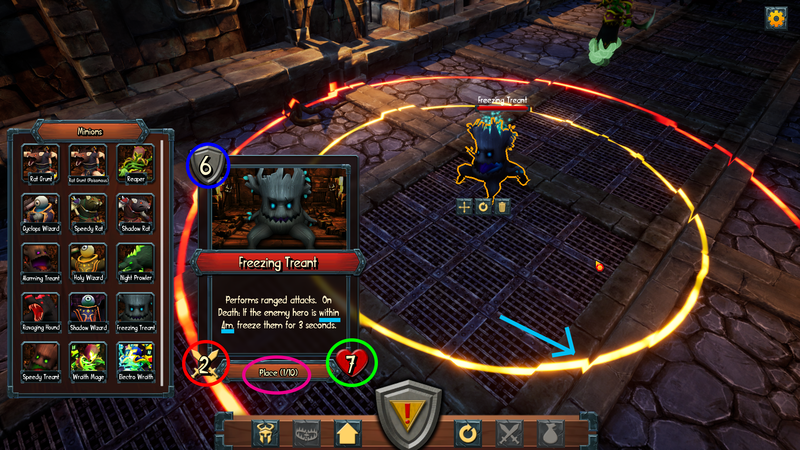 Most blog posts will cover a small feature, such as a single trap, minion or mechanic, but others (such as this one) can go into much more detail in regards to a specific part of the game. Be sure to subscribe to our newsletter by entering your email address on the front page to be instantly notified of new updates! In this week’s post, we’re going to take a look at one of the most integral parts of Heroes of Fortunia: Edit Mode! 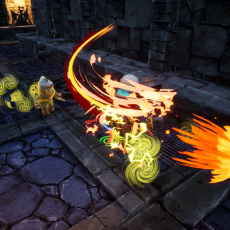 As you may know, the gameplay of Heroes of Fortunia is split into two elements: Dungeon building and dungeon raiding. In Edit Mode, you strive to accomplish the most important task of all: Building an impenetrable dungeon that no one (besides you) can beat! Let’s go ahead and pick apart the screenshot from above a little bit, so you can understand the UI of Edit Mode, and the general workflow that will await you once the game releases. The green rectangle highlights the Action Bar. While in Edit Mode, this will be your main place of interaction with the UI, aside from the inventories. The three buttons on the left let you access your different inventories, whereas the three buttons on the right offer more generalized functionality. The circular arrow lets you reset your dungeon to your current published version, the crossed swords let you attack another player’s dungeon, and the sack leads you to the Treasury, where you can get additional minions & traps. The red circle highlights the Publishing Button. Whenever you make a change to your dungeon, a yellow triangle with a red exclamation point will appear, letting you know that you first need to beat your own dungeon before it will be shown to the world. Once you successfully do that, the triangle will turn into a green tick, letting you know that the dungeon you see right now is the same that other players see when attacking you. The blue rectangle highlights the Inventory. In this case, the active inventory is the Minion Inventory, which will be explained in more detail below. Your inventory displays all available components and allows you to place them in your dungeon however you see fit. The yellow arrow points to the Placement Box. 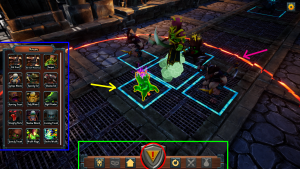 The placement box determines where components (minions & traps) can and cannot be placed. One component’s placement box may never intersect with another component’s placement box. The size of the box is determined by two factors: The component’s size, and the component’s defense rating. (more on defense rating later) This ensures that you cannot place too many powerful units next to one another, and encourages the construction of well thought-out dungeons. The pink arrow points to the currently selected minion’s Engage Radius. While not visible during an attack, once the enemy hero crosses into a minion’s engage radius, it will start following and attacking them until it dies or becomes disengaged by an effect or ability. Also, whenever a minion’s description mentions the word “nearby”, it refers to the minion’s engage radius. Most minions have the same engage radius, but there are small cases where it can be bigger or smaller. Minions, Defense Rating & More! Some minions with special effects may have additional UI elements to help you decide where to properly position them. Once again, let’s pick apart the above picture and go through everything that’s in it! The blue circle highlights this component’s Defense Rating. As mentioned before, the defense rating plays some role in regards to the size of a component’s placement box. But that’s not all of it! There is also an upper defense rating limit that your dungeon cannot exceed. This is mainly to make sure that there are no dungeons that take an absurd amount of time to complete. There are also some minions or traps with special effects relating to defense rating, such as an ability that only affects nearby minions with a defense rating of 5 or less. Rooms do not have a defense rating. The red and green circles highlight this minion’s attack and health respectively. These are attributes unique to minions, as traps do not have either attack or health. Note that a minion’s attack is the amount of damage the enemy hero suffers from a single hit, and has no relation to its attack speed, which is currently not reflected in the minion’s description. And finally, the light blue highlights show you this minion’s custom effect. Upon death, this minion will leave behind a patch of ice that will freeze the enemy hero if they stand within it. The radius of this ability is reflected by a custom yellow circle during edit mode, so you can place this minion e.g. inside a small enough corridor so that this ability becomes harder to avoid. We hope you enjoyed this week’s glimpse into Heroes of Fortunia‘s Edit Mode. Be sure to check back on our blog next Friday for another awesome update! Subscribe to our newsletter on our front page to be sure you never miss a new blog post. Sign Up Today for Heroes of Fortunia’s first Closed Beta Test!